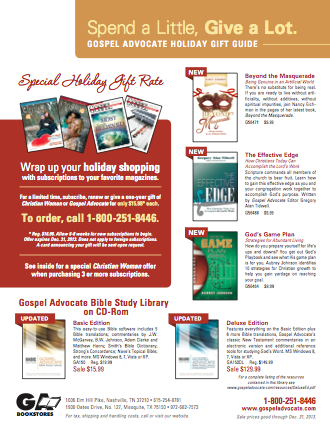 Don’t miss our 2013 Gospel Advocate Holiday Gift Guide. It is filled with great gift ideas, new products from Gospel Advocate Publishers, and deals on Gospel Advocate books, magazines, and commentaries as well as Bibles, Bible study tools, children’s resources, acapella CDs, and personal devotional books. All sale prices good through Dec. 31, 2013. The guide also includes a coupon for 10% off any order of $50 or more, which can be used in-store, over the phone, or online! Each of the titles and products in the PDF guide are linked with our online store.